It had been eight years since Hurricane Katrina had ravaged New Orleans when these photographs were captured. For nearly a year after the storm hit in 2005, Hurricane Katrina and the affected areas were front-page news across the nation. I began this body of work with the idea that these areas deserve a second look. 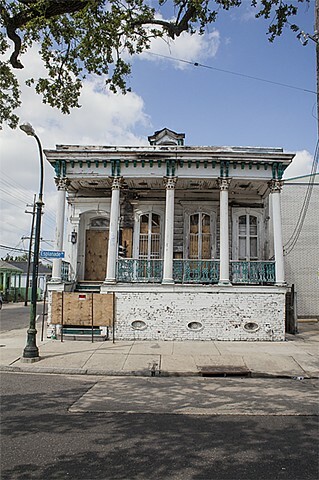 The photographs selected display the past interactions between the people affected by Hurricane Katrina in New Orleans and the space they lived in by exhibiting what the affected areas look like today. When I first visited New Orleans, I was intrigued by what I saw in the hardest hit neighborhoods nearly a decade after the storm. With many places seemingly left to decay while other were just beginning the rebuilding process or nearing completion, in front of me were mixed results of recovery. I found that even in the decay of abandoned homes there is immense beauty, culture, and uniqueness left behind, so embedded in that city that no disaster could take that away.